Greetings! It's been quite a long time since the 0.2.0 release, and a new stable build is finally available. As usual, a new stable release means an updated demo too; if you're still on the fence about supporting the development of Mannequin, now is the time to check out its latest development state. The default male template is now here! The options available are still very limited, but since the groundwork has been laid out, hopefully the progress of adding poses, expressions, hairstyles and clothing will be quite fast. Performance boost! As promised before, we are continuously improving the rendering speed so that complex characters can be created comfortably. Our latest build will bring up to 66% faster rendering speed which can be felt significantly during template, pose and component (clothing/face/hairstyle) changes. The UI has been tweaked little by little to improve navigation. As our content continues to grow, we'll be sure to constantly re-evaluate the user experience to maintain a fast and easy workflow. Art style adjustments is also constantly being done. As we work towards the completion of our default content, many existing components are adjusted to provide a consistent quality no matter what template or components we chose. We also wanted to give a big thanks to tearsforlu and Sevanrakon who has helped us with bug reports in the nightly builds prior to this release. Really appreciated! Before deciding to go with 0.3.0, there's one main feature that we wanted to complete first, which is user-made components. Expect some basic groundwork for this to be available in the 0.2.2 release, alongside new and refined templates, UI, and performance tweaks. As usual, those who already has access to nightly builds will experience this first-hand. That's it for now! Since the initial 0.2.0 release we've been evaluating our communications strategy, cutting our unused channels (Tumblr, Instagram) and optimizing the important ones (devlogs for detailed news, Twitter for more frequent, bite-sized updates) so hopefully we can get a little bit closer moving forward. See you in the next update! A 2D Character Portrait Generator. Latest from Nightly: Redraws are Halfway Done! Is anyone else having issues where the clothing options are all blank when you want to add different clothes to the model? Hello! If you don't mind, can you provide more information regarding this but? We've tested various clothing company and found no problems. Is this a one-off situation or a repeated behavior? 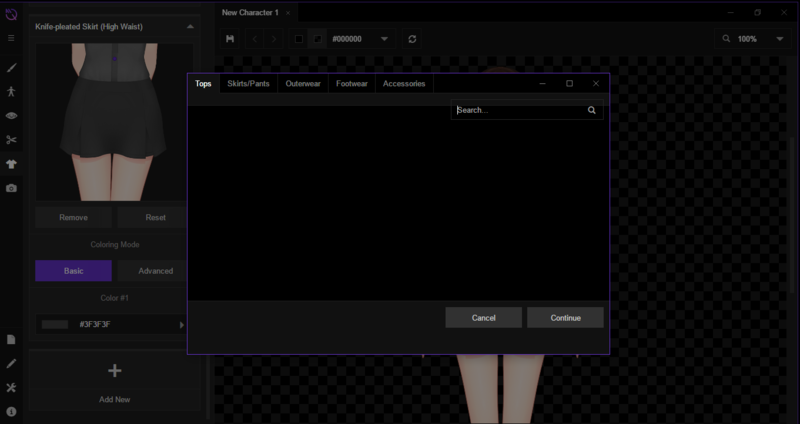 When I pressed Add New in the clothing options, no clothes showed up, I tried reinstalling but that didn't work, I installed it through itch, and have not messed with any of the files. We'll check it out ASAP. Thanks for the info! Hi there! If you're using the itch.io app, just let it auto-update and this should be fixed by now. We're really sorry for your inconvenience, and just let us know if another problem happens!